Our focus on national security, our customers and our ability to support their mission-critical activities, has helped us build a reliable reputation dedicated to performance, diversity in scope and implementation from design development to final product. AGC’s secured specialty division offers “turn-key” services and solutions for our government and private intelligence community customers. Our elite special projects crew members have developed a high level of expertise in completing all types of SCIFs (hard wall and portable). They have many years of experience from across the globe in the application of foil, security metal, physical ductwork protection, welding, electrical design, installations and the construction of SCIF walls. Their expertise and experience assures the customer that the project will successfully complete the physical accreditation process. To that end, AGC also provides our own pre-testing analysis to ensure accreditation. • A SCIF is a Sensitive Compartmented Information Facility which can provide classified/secured and unclassified/sensitive information that needs to be housed in a secured environment for physical and/or technical security purposes. It provides critical infrastructure protection as needed based on the individual customer needs. • A SCIF can require a multitude of criteria, such as, STC rated doors and walls as well as potential threats in voice reverberation in HVAC ductwork. Secured video teleconferencing as well as High Low Data/Comm feeds may need to be part of these requirements. The advantage AGC has over the construction industry is the extensive knowledge and field experience required to achieve 100% accreditation, guaranteed. SCIFs were originally set up in an effort to shield communications from the many ears of the outside world. Designed by intelligence agencies to ensure protection of highly classified information, today more and more private consultants and top corporations are investing in the technology in an effort to safeguard proprietary secrets, due to our increased access to eavesdropping technology. The SCIF (Sensitive Compartmentalized Information Facility) refers to accredited room, area, building that must meet certain specifications as set forward by the Director of Central Intelligence (DCI) in DCID 6/9. Access to SCIFs is limited to those with security clearances sometimes as high as SCI (Sensitive Compartmented Information) and conversations held in such locations are restricted from public disclosure. Wtihin the past several years, a need has arisen for an alternative to the conventional permanent wall construction SCIF used to store intelligence-based SCI data. With our military troops deployed in multiple locations, the need for a mobile-configured SCIF has arisen as well. AGC provides these type of portable / modular SCIF facilities catered to meet the mission-critical needs of each customer. AGC can design, build and deliver Portable or Modular Containerized facilities, to meet the customer’s specific requirements and needs. These “ in-the-box” solutions offer self-contained power and cooling systems as well as customized interior finishes creating a fully functional and comfortable work environment. AGC assures the customer that these facilities are designed and manufactured in compliance with existing building codes and that they meet or exceed required security levels. 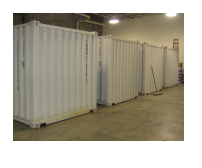 These portable containers offer a secured solution to an immediate need for additional space, or a quick setup at a new location. Functionality is the key element of their design; whether for data storage, conferencing or other SCIF needs. A mail-screening facility is a specialized container that must meet or exceed certain security requirements. Containers are designed pursuant to the customer’s specific needs and are fabricated to meet or exceed the specifications. These portable containers are built to code and are complete with lighting, basic power and cooling systems, as well as customized interior finishes. AGC has designed and constructed numerous mail-screening facilities, and has provided their delivery throughout the world.